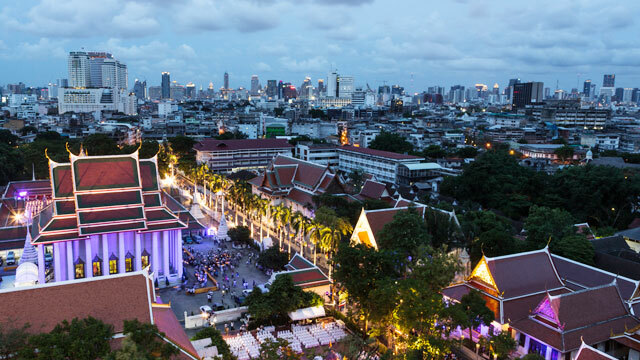 Bangkok is the world's most visited city. Think you know which city is the world's most visited? If you guessed London, New York or Paris, you would have guessed wrong. According to the recently released Global Destinations Cities Index by MasterCard, an Asian city tops the list of having the most international visitor arrivals in 2013. The winning city narrowly inched out London, the top spot in 2012, for the No. 1 spot by 200,000 visitors. This year is the first time since the launch of the Index in 2010 that an Asian city came in at No. 1. And the winner is: Bangkok. The capital of Thailand, according to the Index, posted 18 percent growth rates in the past two years. Two years ago, Bangkok ranked No. 3 on the Index. Istanbul and Dubai also showed dramatic growth in international visitors. Paris (No. 3) dropped a spot since last year; it's the only city in the top 20 that shows a projected decline in the number of international visitors. "Destination cities in emerging markets in the Middle East and Asia are expanding the fastest in being connected to the rest of the world through having more flights to more cities, and more frequent flights to cities where they are already connected," the report noted. "This will strongly drive the growth of their visitor arrivals and cross-border spending in the coming years." Only two U.S. cities made the Index's top 20: New York City, which came in at No. 5, and Los Angeles, coming at No. 20. When it came to visitor spending, however, New York did take the top spot, with an estimated $18.6 billion in international overnight visitor spending. By that measure, Bangkok, with $14.3 billion, ranked No. 4. +Who Are the World's Best Tippers?